Keep your firearm clean and safe to operate. Features a Dual Axis cleaning rod handle that allows the user to choose between swivel or fixed action. Each kit contains premium components for a thorough cleaning experience. 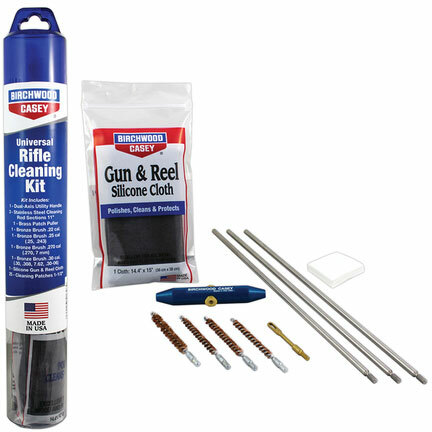 Kits include cleaning rod, Dual Axis Handle, brushes, patches, patch puller and Silicone Gun & Reel Cloth. Made in the USA. Three 11-inch cleaning rod sections; Dual Axis Handle; .22 patch puller; one .22 bronze brush; one .25 bronze brush; one .270 bronze brush; one .30 bronze brush; one Silicone Gun & Reel Cloth and 25 patches 1.5 inches.